For decades, Tony Hillerman brought New Mexico to life through the pages of his marvelous books. Featuring Navajo detectives Joe Leaphorn and Jim Chee, Hillerman wrote mysteries that shared the beauty of the Navajo nation and its people. Often the landscape itself became a character, with its sacred mountains, its desert climate, and its vast distances between the small towns in the reservation and nearby. Tony Hillerman died in 2008, but his characters continue to live in new works by his daughter Anne. In her 2017 novel Song of the Lion she continues their story as they work to solve a car bombing. An alumni game has brought past basketball heroes back to Shiprock High School. One of those alumni heroes has apparently also brought an enemy with him, as his car blows up during the game, killing a young man whose connection to the target is unknown. Officer Bernadette Manuelito, wife of Jim Chee and herself a Navajo police officer, is attending the game as a spectator. When the bomb goes off she immediately begins working to secure the scene and help the victim. Afterward, she, her husband, and retired Lieutenant Joe Leaphorn find themselves protecting the target of the blast and working to solve the mystery. Who wanted to harm the man, now a lawyer in Phoenix? Was this related to the mediation he was involved with over plans for a resort in the Grand Canyon? Who was the dead man, and how did he fit into the situation? Throughout, Hillerman’s characters weave their way through Navajo and other native tribal sensitivities and through the desert Southwest which is the silent but still powerful character in all of the novels. Anne Hillerman shares the profound respect for the Diné, the Navajo name for themselves, that her father had. You cannot read a Hillerman book without appreciating the care he or she has for the people who inspired those characters. Anne Hillerman may be a bilagáana (white person) herself, but she writes in love and with a deep desire to get it right. Her father was named a “Friend of the Navajo” by the tribal council in the early 1990s, and she clearly works to make sure his legacy and her own continue accordingly. There is not a bad place to jump into this series. Whether you pick up the latest book (2018’s Cave of Bones) or go all the way back to the beginning (Tony Hillerman’s 1970 The Blessing Way), you will be rewarded by strong characters, intriguing plots, beautiful settings, and the powerful and rich culture of the Diné. 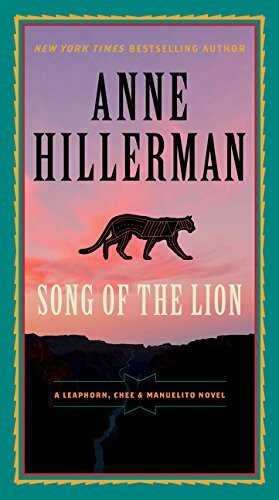 Anne Hillerman, like her father Tony Hillerman, can take a standard mystery novel and weave into it the beauty of New Mexico and its native people to create something beautiful.